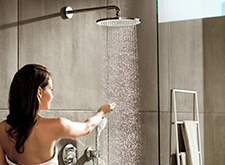 Here you will find the new mixers, showers and sinks from premium brand hansgrohe. We have developed them with our passion for water and German engineering flair. Check out trendsetting solutions, which will turn your daily encounters with water into a great experience every single time. Innovative technologies and award-winning design ensure one thing above all: The beauty of water. 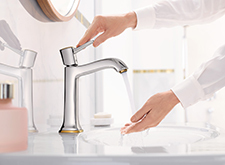 Contemporary, clean design: The new hansgrohe range offers a wide variety of possible applications for wash basins, bath tubs, showers and bidets. Who knew that technology could create such a cosy experience: hansgrohe has developed the PowderRain jet type, for us to enjoy the beauty of water. Enjoy this ultra-soft showering experience every day. Square, stylish and easy to combine: The top-quality Raindance E range is impressive thanks to its amazing water-related capabilities, and will enhance any bathroom with its elegant chrome and glass surfaces. The striking design will become an eye-catching feature in your bathroom, and it also looks great in combination with the new Metropol mixer range. The wide shelf of the ShowerTablet offers added convenience. 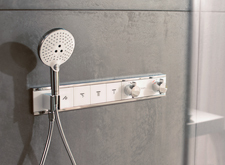 Check out the latest control centre from hansgrohe for relaxing showers: up to five water sources at the touch of a button, with the jet type you want and at the feel-good temperature that is right for you. Large glass surfaces and a slim silhouette give space-defining character to the RainSelect design. Experience this round, easily combinable allrounder in a whole new dimension: the single-jet overhead shower Croma 280 with RainAir shower rain is 280 mm in diameter. Great design and large-scale showering indulgence at an attractive price, available in two variants: as an overhead shower or Showerpipe shower system. Experience added comfort and enjoy TÜV-tested safety in the shower, for the whole family. Unica Comfort combines shower and grab bar in one product, and also offers a foot support for safe showering along with a convenient shelf. Check out the expressive design of the Metropol mixer range and immerse yourself in a world of precise geometric forms. Precision contours and expansive surface areas define the high-quality mixers for wash basins, bath tubs or showers. Choose from five different heights. Corners and edges can be elegant! Add a touch of splendour to your bathroom with the elegant Metropol Classic mixer range, which integrates perfectly into classic styles. The extensive range makes it possible to create consistent design for wash basin, bath tub and shower, where elegant details in gold finish set stylish accents. 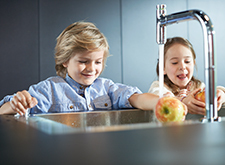 Check out our new products for the very heart of the kitchen – including the high-quality sink, ergonomic, user-friendly kitchen mixers and the innovative sink/mixer combi unit. You will be able to enjoy your new kitchen workspace, which fits your requirements exactly, for a long time to come.